Scotland NC500 day 6. 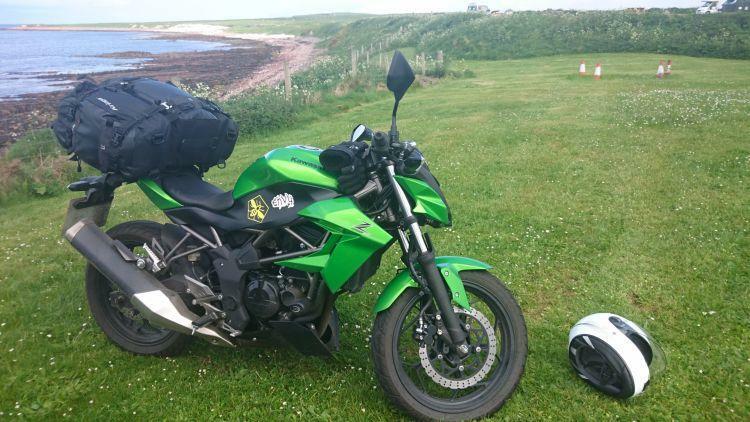 Durness to John O'Groats 90 miles. Fortunately the predicted Armageddon of disastrous weather that was foretold by weather men never arrived. Always listen to the ferryman he knows best. It had rained during the night and that means soft slippery ground. We are camped on a incline and as I watch some riders nearly coming to grief as they spin and slide all over the place while getting their bikes off the grass I am beginning to panic about my own departure. Ren seems to lose patience a little at my flapping and not knowing what route would be best to get off the grass to ensure safe passage. I do not think I would be in such a flap if I hadn't seen other more experienced riders than me struggle this morning. To him it is amazingly simple to figure out the best path. I ask for his advise and then proceed with caution. My heart is pounding as I get on the bike. I really do not want to fall off in front of everyone one this morning. Maybe it was taking Ren's advised path off the grass but the journey from slippery wet grass to path was surprisingly easy and event free, phew. Once on the path I decide to go get some petrol while Ren finishes sorting out today's details with the other riders. The local petrol station only has two pumps and as I approach the first one is in use so I pull up to the second one. The first problem I encounter is the surface of the petrol station is well - err - broken boulders. It takes me all my limited off road skills to keep the bike upright. Second problem the second pump I pull up to is diesel only. Nice one. I have no chance of trying to push the bike backwards to the first pump on this broken up hole ridden surface. So I will just have to exit and then turnaround somewhere and come back for another attempt. As I turn around in a side road I am suddenly joined by Ren. We go back to the petrol station and I stop at the correct first pump and encounter problem number 3. The rocky ground is so lumpy and on such a ridiculous camber I cannot even get my side stand down to get off the bike and fill up. Oh this is bloody ridiculous. Ren has to hold my bike while I gingerly get off, use my card to pay at the self issue machine and get my fuel. Then I slip and slide and bounce my way back onto the road. 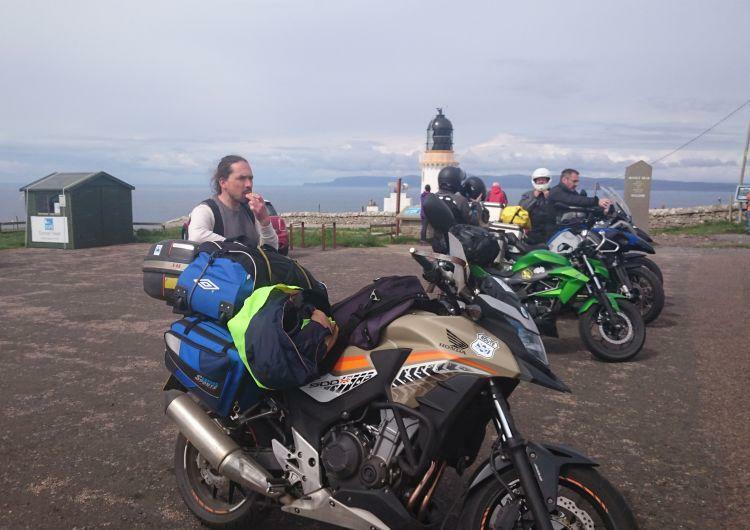 Can I advise anyone stopping in Durness on a motorcycle to get fuel before or after Durness. Unless of course they have invested in some smooth tarmac on the floor of the petrol station by the time you are there. 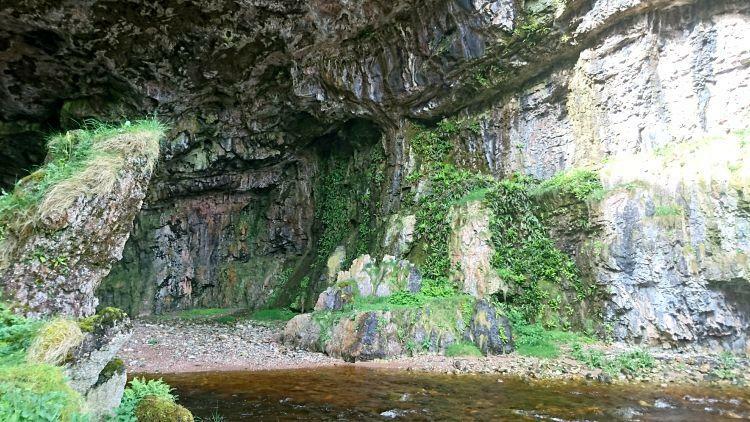 Our next destination this morning is a short trip to Smoo caves. This is another place suggested by Nick. I hope this actually exists unlike Hagrid's House and is not just another departed movie set. 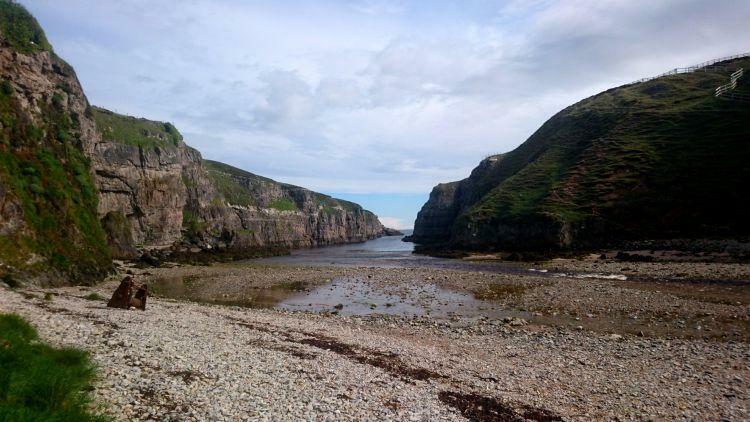 We pull into the car park for the caves just as the sun peeps out from behind the clouds. Nick and his band of merry men and woman are already there and assure us they have just been to see the cave. Well that is a good start at least. 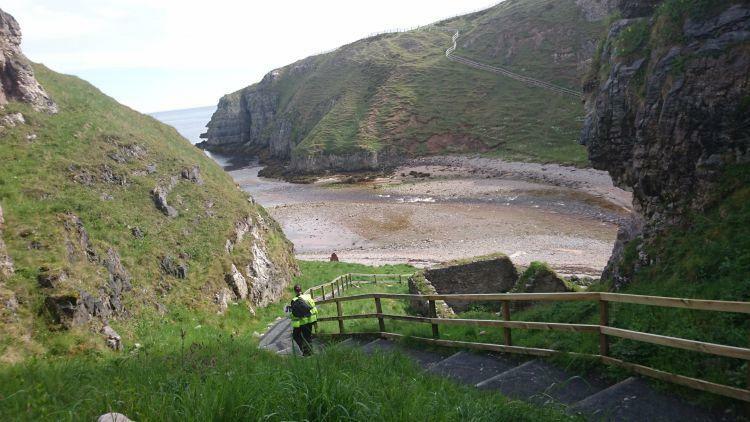 The descent down to the cave is a long series of wooden steps. No film set hickory pokey is required here, the view is natures own pure majestic magic. The cave itself is shallow with a high roof. A little wooden walkway within the cave takes us through to a second chamber. Here a thundering waterfall surprises us with its sheer force and drenches Ren and I in a fine mist in seconds. It feels delightful and I smile and giggle while being treated to one of nature's sublime showers. I know my fringe will suffer my indulgence as I stay far too long . It will thank me by curling up and frizzing into a strange mythical beast upon my forehead. Oh well I always have a helmet to pull on. It is also just as well we had our waterproofs on while beside the waterfall but they prove a huge hindrance for the ascent back up all those steps. For the return trip up the steps the sun has come out in full force. Full bike gear and waterproofs is not the best clothing to be climbing in. I need to stop a couple of times to catch my breath while pretending casually to just be stopping to admire the view. I may not be drowning here folks, I am just not breathing ok. Once again I am reminded how unfit I am, I really must do something about that one day, soon, maybe. Never forget when there is a down there always is a up. I am hot and sticky by the time I reach my bike so I pull off all my waterproofs and fight to squash them into my luggage. I then can not find my bike keys. Were they in the pockets of my waterproofs? So now I pull and tug my waterproofs back out of my luggage. No keys. Arghh, panic setting in here now. What if they are in the bottom of the waterfall?? I try to stay looking calm on the outside while inside I have a mini meltdown. Where are my keys, where are my keys WHERE ARE MY...ohh there they are just laying casually besides my helmet...mocking me. The waterproofs are then squashed once again into my luggage. I can feel Ren's eyebrows lowering as he watches me. Yes ok I know this luggage is not made for actually getting things in and out of with ease. 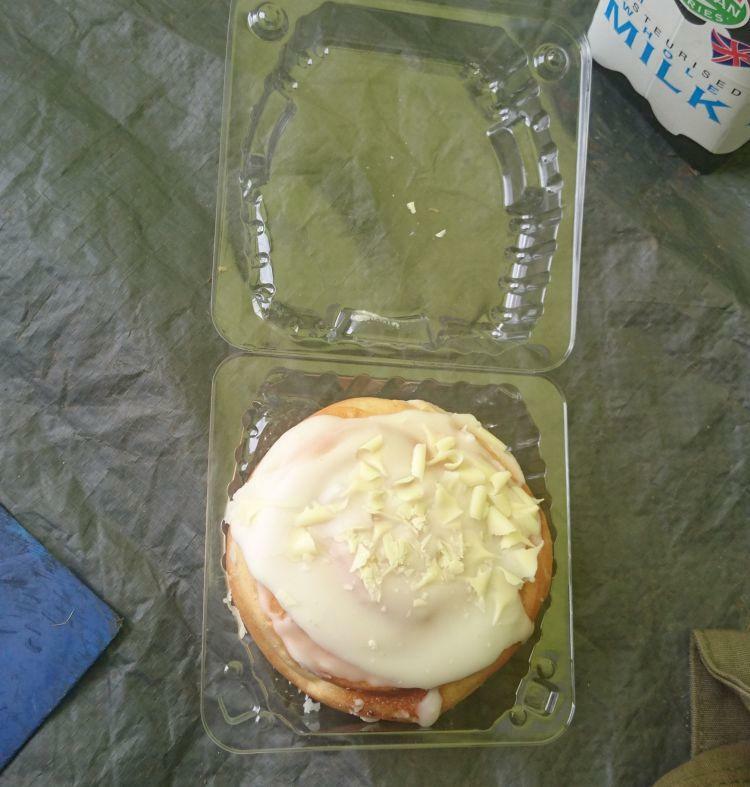 It is a faff and Ren scorns faff but it is the best I have. This time consuming performance may be driving Ren mad but I am just delighted that I actually have luggage for my bike these days. Just one more shove and there we go. Oh hang on let me just re-tighten them straps, oh just one more tug and another for luck. Oh does my luggage look straight I ask Ren? Err maybe its time to go now eh before Ren's brows lower so much as to become a moustache. The ferryman told us it would be a bit blustery with some heavy showers and so it proves to be. The sun soon hides behind clouds and it is time to get them waterproofs out...AGAIN. I dare not even look in Ren's direction as I heave and pull them back out of my panniers. The side winds make for some interesting riding as do the lambs and Highland calves trotting down the roads. The baby cows are adorable with their super cute pink noses and mops of hair but I do not want to be too up and close and personal with them. So I do my best to steer as wide a berth as I can around them with my bike. We ride along a mixture of single tracks and then more open roads. The rain continues so by the time we get to Tongue it is time to find some relief with a stop and a brew. A charming cafe offers us a warm welcome despite our soaking gear making puddles everywhere. We are joined by another biking couple who's own clothes drip adding to our now shared puddle while we have a lovely chat. They are touring two up on a Vespa and it is most enjoyable to sit and relax chatting away to this delightful pair. Their ability to carry hardly any luggage puts me to shame as usual but I do try you know I really do. You just never know when that extra top might just save the day. The dramatic Highland scenery is beginning to be left behind as we continue onward. The landscape changes from the dramatic, stark mountain ranges of the Highlands to greener hills. Still pretty and scenic but not as awe inspiring. We pass a pub and then realise we recognise the bikes parked outside. That'll be Nick and his crew. We turn around to join them, it is time for another stop and hopefully something to eat. Nick is eating soup which resembles more a stew with so many chunky vegetables packed into it. I order the same and it is a delicious and hearty meal to warm up a soggy biker. The crew wave us goodbye as they leave to continue their journey. A few minutes later Marina's is back. She forgot to pay for her food. Whoops. 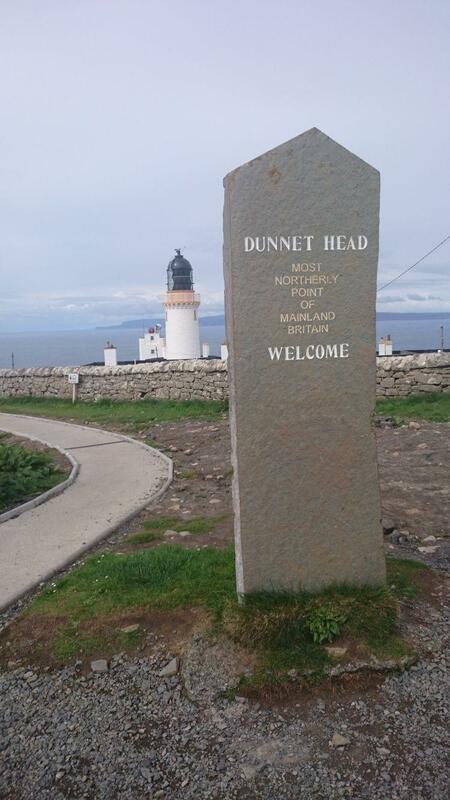 Back on the bikes and the rain eases as we travel to Dunnet Head, the most northerly point on the mainland. As we pull into the car park I notice I am being observed very closely by a couple climbing onto their bike. I park next to them and receive more stares. Ok I am feeling vaguely uncomfortable now. Do I really look so strange? 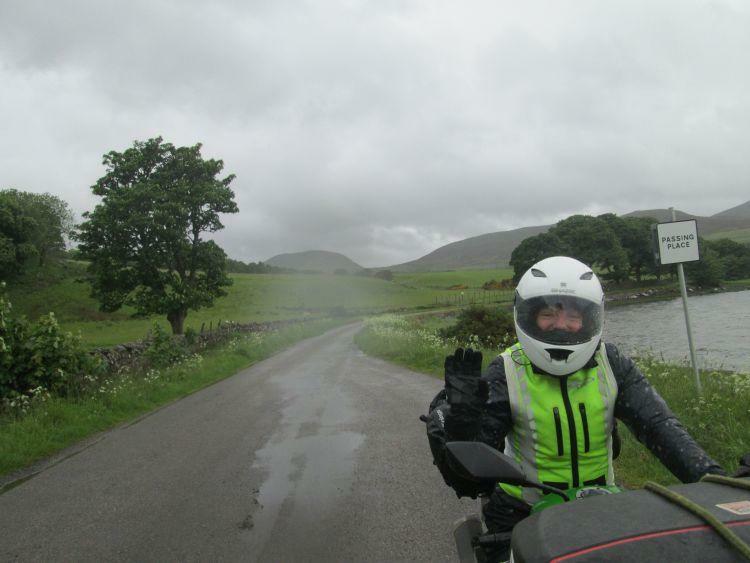 As I pull of my helmet I am asked by the bikers if I am called Sharon because they think they recognise my bike from that Bike And Travels website. Well bowl me down with a haggis, is this fame at last. Fantastic!! We chat while Ren tries to demand some attention but without success. Aww poor Ren that's what happens when you ride a beige bike instead of a shiny green one. There is no justice in the world but there are bikes to ride so onwards Ren, continue to lead your protegee to future success. 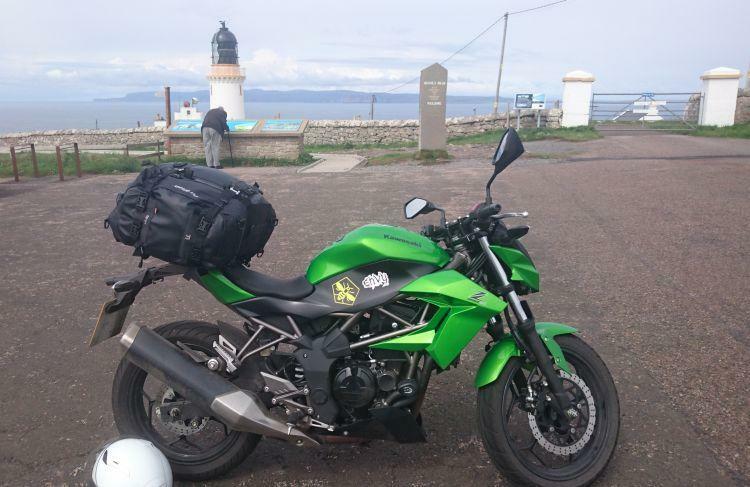 Next stop is the famous John O'Groats. 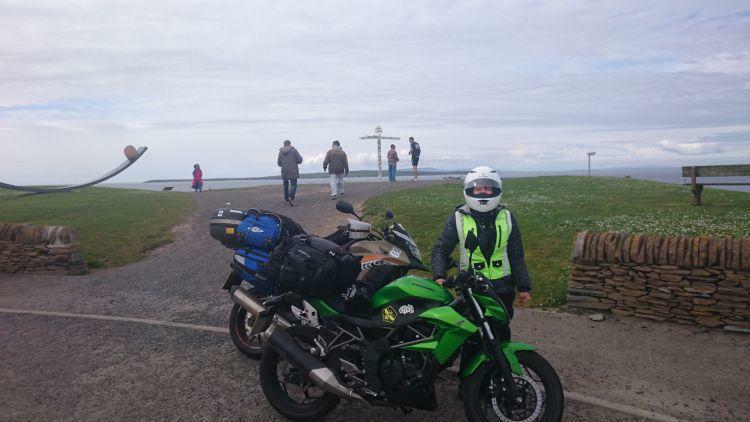 I have been here before but not under my own horse power so I am rather thrilled to have a photo taken here with my famous bike. Haa ok enough already before Ren kills me. Yeah so happy to be here. Two vivid blue riders pull up alongside me. No way, can this be? Yes it is only my beloved blue German friends. Lauren and I exchange excited chatter and huge smiles. Fate had dictated we are definitely destined to become friends. Meeting up twice may have been a coincidence but three times? This calls for an exchange of email addresses for we must keep in touch . I am so thrilled. It may seem silly to some but I feel this friendship was simply meant to be. I hardly know this couple but I have an affinity to them and I joy at meeting them again that belies our brief acquaintance. They make me truly happy to be in their company. This reminds me once again that being out and about and travelling gives us the opportunity to meet those strangers who become our friends. In a world that sometimes can feel so hostile as we watch in horror the news stories on our television sets, it does us wonders to be greeted by warmth and smiles by our fellow travellers. Secure in the knowledge that I will keep in touch with my new found friends it feels ok to wave them goodbye now as we leave to pitch up at our campsite for the night before the gathering clouds deposit some more rainfall. 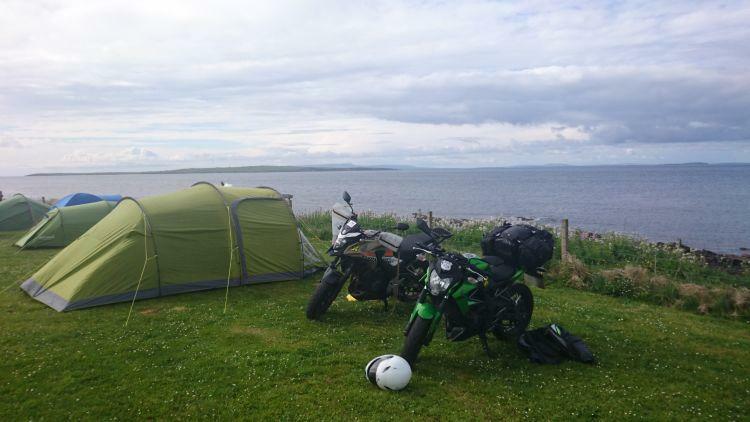 The campsite at John O'Groats is rather exposed to say the least being right on the hill overlooking the vast ocean. I surely hope that the blustery conditions are over or we could be waking up in the sea tonight. 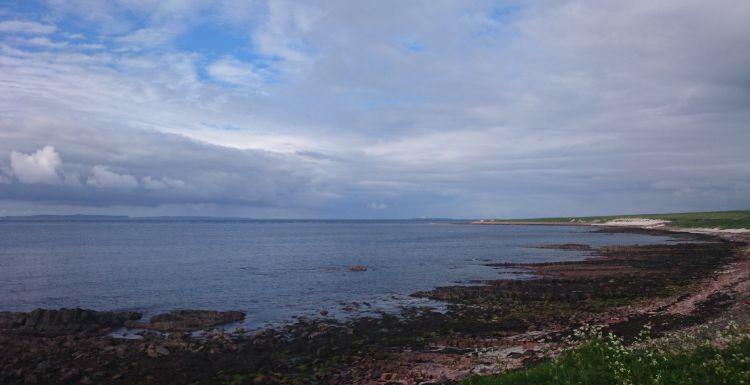 It is a lovely view but lets hope we don't find ourselves having a unplanned paddle in the sea. Batten down those ground pegs Captain. 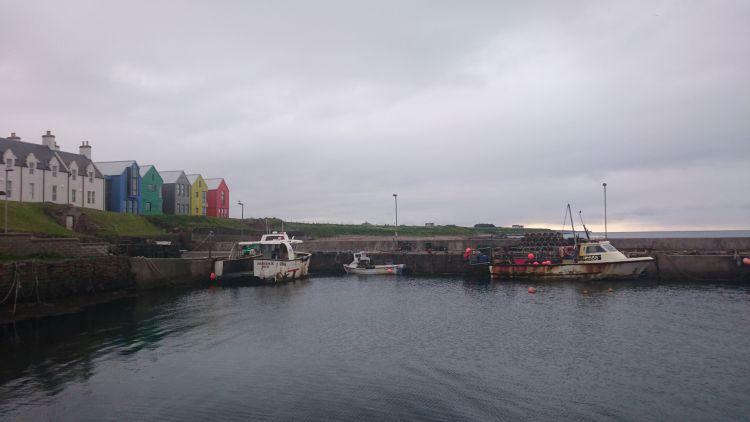 We spend the evening walking around the harbour and later with the other Noo riders in the local pub chatting about this and that. It has been a another great day. I settle in for the night with a sticky bun to eat...happiness.